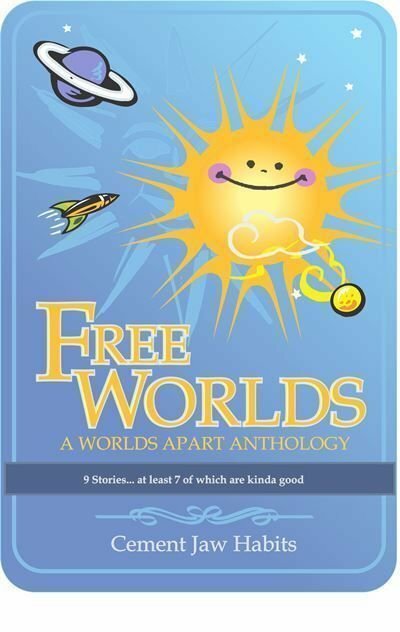 Free Worlds is a collection of shorter stories set within the Worlds Apart Universe. So, you could read these stories and if you think, "These are pretty good," then you could try the books. Or, if you've read the books, you could look at the Anthology as part of nerded-out "Expanded Universe," or something like "bonus tracks" on a 1980's music CD. 'Fiddler's Green' - The crew of the pathfinder ship Pegasus gets more than they bargained for when they crash-land on the planet Fiddler's Green and must negotiate with the planet's strange inhabitants for a "Spaceship Deswampificator" to raise their sunken spaceship. 'Independence' - The crew of Pegasus get more than they bargained for when they get stuck in a weird zone of inexplicable madness following a routine visit to the planet Independence. "Cotopaxi" – The crew of Pegasus get more than they bargained for when they explore an ancient space station in search of parts for their damaged ship. For it seems the entity inhabiting the space station has a way of defending itself from intruders that is so bizarre that none who survive will ever speak of it again. "Alpha Priori" – The survey ship Astra Cartographer’s mission is to discover and exploit ancient Commonwealth technologies for the Keeler Trust and Companies, but the crew gets more than they bargained for when they visit an abandoned research base in the ring system of an artificial planet. "Triton Lyra" – Eccentric interstellar trillionaire Bernadette Keeler takes her ambitious new assistant on a journey to the remote and hostile Triton Lyra system, but the business deal turns out to be more than they bargained for. "Cherchez La Femme" – Young Goneril Lear’s first exo-planetary mission turns out to be more or less what she bargained for. "Pioneers" – How did the human race breed fast enough to colonize an entire galaxy in just 2000 years? This is how. Most of the people get what they bargained for except the poor saps in the colony ships. "Electra IV" – When the Commonwealth of the Galaxy collapsed, a lot of struggling colonies died with it which was probably not what they bargained for. This is the story of one of them.